In case you don't know what a log is, it's a large part of the trunk of a tree that has been cut down. So it's that large, long, round cylinder-shaped tree portion on the bed in the picture. 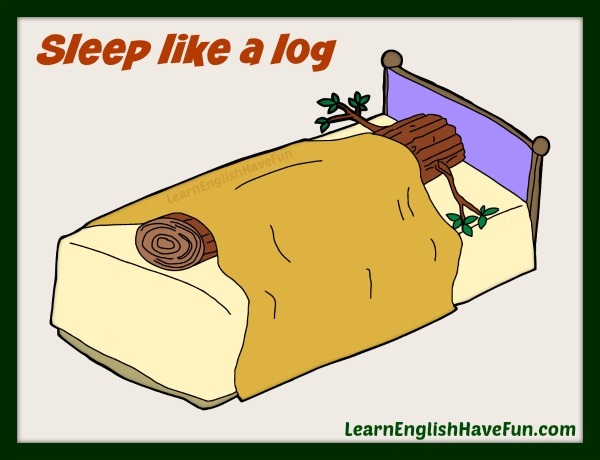 You probably wouldn't think that a log would easily "toss and turn" (move around to different positions) during the night while it was sleeping. It's so heavy and big it would just stay there in the same position and sleep. A log is very hard to move (or disturb). So this is a really easy idiom to remember. It's used frequently in every day informal English. My husband slept like a log the entire flight but I didn't even get five minutes of sleep. Take this pill at bedtime and you'll sleep like a log tonight. Since I got a quality mattress I've slept like a log every night. Sorry I didn't answer your phone calls last night — I must have slept like a log because I never heard the phone ring. "Is your son sleeping?" "Don't worry, you don't need to whisper — he sleeps like a log." I slept like a log my first night in Istanbul. I was so jet lagged that I didn't even hear the call to prayer from the mosque right next to the hotel! Some people don't sleep well after they eat or drink alcohol but I sleep like a log when I do these things. If you found this idiom useful, sign-up for my free newsletter to learn when I add new idioms and other updates to my website. So, tell me when was the last time that you or someone you know slept like a log? Let me know in the comments!